Former three division world champion Robert “The Ghost” Guerrero (31-2-1, 18 KO’s) has gone quiet after getting a big payday fight against Floyd Mayweather Jr. last year in May. Guerrero worked hard to get the fight with Floyd by constantly calling him out in the media for well over a year, and beating Selcuk Aydin and Andre Berto by 12 round decisions. 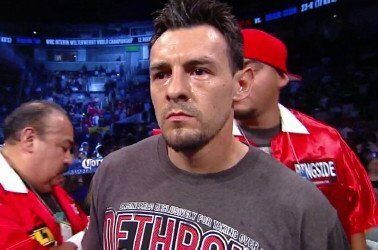 But since the fight with Mayweather, Guerrero has stayed out of the ring and hasn’t scheduled any fights. Last month, Guerrero mentioned wanting to fight Manny Pacquiao in an interview with the Philippine Star. Guerrero felt that this was a fight that boxing fans would want to see. But how can Guerrero call out fighters like Pacquiao when he’s not staying active. Just hanging out and calling out a big name after a loss and a layoff is kind of a weak way of getting big fight. Guerrero should be trying to redeem himself by beating some top contenders in order to prove that he deserves a big fight. You can’t take him seriously if he’s just resting on his laurels after a loss and saying he wants to fight a big name like Pacquiao. It doesn’t make a lot of sense for the 30-year-old Guerrero to work so hard to get a big fight against Mayweather, and then just disappear after he gets the fight. We saw that from Joshua Clottey after he got his big money fight against Manny Pacquiao in 2010. Since the Pacquiao fight, Clottey has fought exactly two times in the past four years. Before he fought Manny, Clottey had been fighting 2-3 times per year. But once he got the Pacquiao fight, Clottey has rarely fought since then. Guerrero isn’t the kind of talent that can just sit back and let an entire year go by and expect to be the same fighter he was before the layoff. Guerrero’s not talented enough, and the welterweight division is too good for him to be staying out of the ring for long periods. By the time Guerrero does get a fight scheduled and he’s ready to fight, he’ll probably have been out of the ring for over a year. That’s pretty sad.